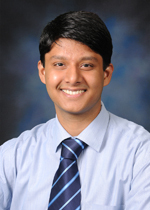 Dr. Srikanth Ravisankar is a Clinical Assistant Professor at the Brody School of Medicine, East Carolina University. After graduating medical school in India, he moved to the US and he completed his Pediatric residency and Neonatal-Perinatal Fellowship training. Though he has varied research interests, his primary focus revolves around two areas- the role & regulation of tight junction proteins in the pathogenesis of necrotizing enterocolitis (NEC) and prevention of intraventricular hemorrhage (IVH) in preterm neonates. He collaborate with a cell biologist and they have successfully replicated an established NEC mouse model to pursue our research in tight junction proteins. He also lead the Golden hour quality improvement initiative in their NICU which has significantly decreased their rates of IVH and positively impacted outcomes. Additionally, he is very passionate about neurodevelopmental outcomes of extremely preterm neonates. 1.“Congenital Hyperinsulinism: Persistent Hyperinsulinemic Hypoglycemia”.Ravisankar S. Diabetes, Clinical Case Series 1, First edition, 2016 (ISBN: 978-93-5250-032-1). 2.“Relationship between Packed Red Blood Cell Transfusion and Severe Form of Necrotizing Enterocolitis: A Case Control Study”. Garg P, Ravisankar S, et al. Indian Pediatrics. December 2015. Volume 52:1041-1046. 3.Necrotizing enterocolitis in a mouse model leads to widespread renal inflammation, acute kidney injury, and disruption of renal tight junction proteins. Garg P, Tatum R, Ravisankar S, et al. Pediatric Research. September 2015. doi:10.1038/pr.2015.146 . 4. “Is Cronobacter sakazakii infection possible in an exclusively breastfed premature neonate in the neonatal intensive care unit?”: Ravisankar S, et al. J Perinatol 34: 408-409; doi:10.1038/jp.2014.14.